I don't know how it is that we weren't aware of yeasted, or raised waffles until a few years ago. I do know that we no longer make them any other way. Adding yeast to the batter and letting it work its magic overnight decidedly improves the texture and taste of waffles. They end up airier and with a more complex flavor. And they aren't really any more difficult to make - you just need to remember to mix up the batter the night before. Here is the recipe we use. If you've never tried it, I highly recommend you give it a go. You may well become converts like we are. Serves 4. A Belgian waffle iron with deep groves works well with this batter. Recipe from Marion Cunningham's "The Breakfast Book". The night before, find a large bowl big enough to allow the batter to expand to twice its volume (it will rise and fall overnight). 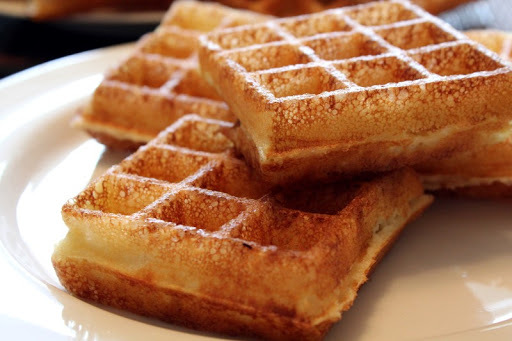 Mix together all of the waffle ingredients except the eggs and baking soda (Note: if using active dry yeast, add it to the water for a few minutes before stirring in the remaining ingredients). Stir well, cover and let sit at room temperature overnight. In the morning, crack the eggs into a small bowl and beat with a fork. Add the baking soda and eggs to the batter and stir well. Heat a waffle iron over medium high heat. Pour in about one scant cup of batter, and close the iron. If using a stove-top waffle iron, turn after about 30 seconds, then turn every 2 to 3 minutes until the steam reduces drastically (about 8 minutes for us). Remove the waffle when the outside is golden and crisp. Keep warm in a low oven. Avoid stacking the waffles to help keep them crisp. Leftovers can be frozen and then reheated in a 400 degree oven for about 15 minutes or until crisp and hot.